Hello, dear Blog — yes, I am still here. Alive and kicking. Still trying to figure out what is wrong with my WordPress setup. Sigh. Since Nevilley drew my attention to the RSS problem, I am thinking that we should forget Category listings and turn Permalnks back on — at least for now. I shall continue to seek a proper solution. …for only yesterday I found myself catching up with new patterns at Ravelry. I noticed in the New and Popular panel, a pattern that I was not familiar with… and I took a look. I was immediately smitten with the 22 Leaves Shawlette mystery KAL. There were photographs of shawls where Clue 2 had been completed and that was enough to send me hunting for yarn. (I chose a Colourmart yarn, of course, might as well kill two birds with the single stone.) I cast on yesterday afternoon and while I was knitting, Clues 3 and 4 came out. 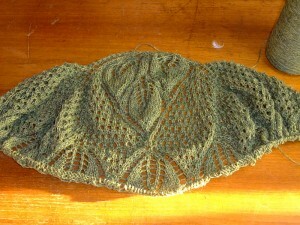 The KAL is being conducted via the blog. PÃ¤ivi asks knitters to post photographs of completed clues under the appropriate post, and when 22 people have completed the latest clue, the next one is released. I have now completed all four clues and heaved a sigh of relief after a valiant effort but… there are already 10 comments, so it looks as though Clue 5 will not be far away! 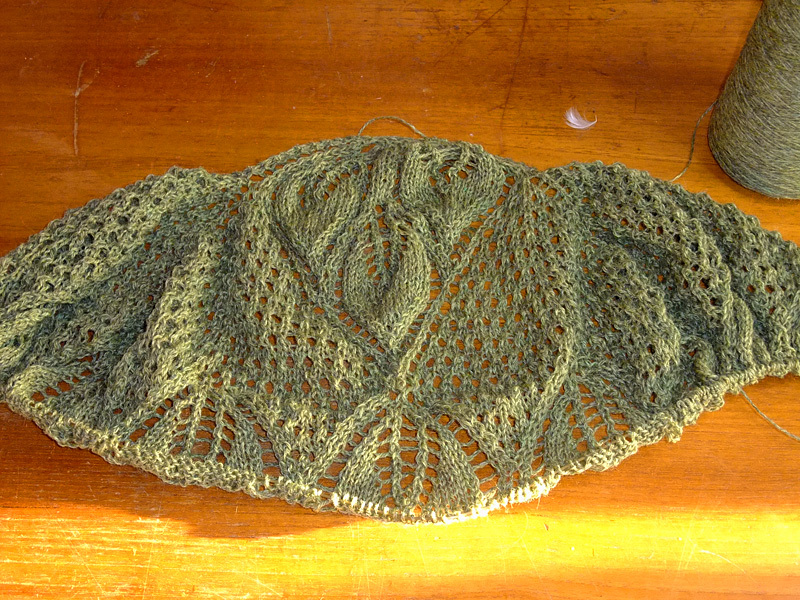 I am left in a quandary: I already have my Bridgewater in production for the Colourmart event and I have also promised toÂ knit an Aestlight… The Aestlight is for a local KAL — some friends wish to learn lace knitting and thereby produce a small triangle shawl. Aestlight is the pattern that they chose. This will be my fifth! There is no doubt that it is an excellent pattern to learn some fundamentals on, but I was hoping that they might select Traveling Woman, or another pattern that I have not yet knit. Anyway, the die is cast and now that 22 Leaves is up to date, I have selected some yarn (yes, Colourmart!) and will spend some time tonight whipping an Aestlight into being so that it is there to be used as a teaching aid. The thing is… I was supposed to be using this week on my own to turn a hebbie fleece into a pile of 3ply yarn. Things, as usual, have gan’ agley.